Soil pH or soil reaction is an indication of the acidity or alkalinity of soil and is measured in pH units. Soil pH is defined as the negative logarithm of the hydrogen ion concentration. The pH scale goes from 0 to 14 with pH 7 as the neutral point. As the amount of hydrogen ions in the soil increases the soil pH decreases thus becoming more acidic. From pH 7 to 0 the soil is increasingly more acidic and from pH 7 to 14 the soil is increasingly more alkaline or basic. Soil pH provides various clues about soil properties and is easily determined. The most accurate method of determining soil pH is by a pH meter. A second method which is simple and easy but less accurate then using a pH meter, consists of using certain indicators or dyes. Many dyes change color with an increase or decrease of pH making it possible to estimate soil pH. In making a pH determination on soil, the sample is saturated with the dye for a few minutes and the color observed. This method is accurate enough for most purposes. Kits (pH) containing the necessary chemicals and color charts are available from garden stores. There may be considerable variation in the soil pH from one spot in a field or lawn to another. To determine the average soil pH of a field or lawn it is necessary to collect soil from several locations and combine into one sample. The effect of soil pH is great on the solubility of minerals or nutrients. Fourteen of the seventeen essential plant nutrients are obtained from the soil. Before a nutrient can be used by plants it must be dissolved in the soil solution. Most minerals and nutrients are more soluble or available in acid soils than in neutral or slightly alkaline soils. Phosphorus is never readily soluble in the soil but is most available in soil with a pH range centered around 6.5. Extremely and strongly acid soils (pH 4.0-5.0) can have high concentrations of soluble aluminum, iron and manganese which may be toxic to the growth of some plants. A pH range of approximately 6 to 7 promotes the most ready availability of plant nutrients. But some plants, such as azaleas, rhododendrons, blueberries, white potatoes and conifer trees, tolerate strong acid soils and grow well. Also, some plants do well only in slightly acid to moderately alkaline soils. However, a slightly alkaline (pH 7.4-7.8) or higher pH soil can cause a problem with the availability of iron to pin oak and a few other trees in Central New York causing chlorosis of the leaves which will put the tree under stress leading to tree decline and eventual mortality. The soil pH can also influence plant growth by its effect on activity of beneficial microorganisms Bacteria that decompose soil organic matter are hindered in strong acid soils. This prevents organic matter from breaking down, resulting in an accumulation of organic matter and the tie up of nutrients, particularly nitrogen, that are held in the organic matter. 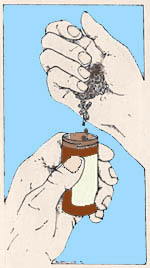 Soils tend to become acidic as a result of: (1) rainwater leaching away basic ions (calcium, magnesium, potassium and sodium); (2) carbon dioxide from decomposing organic matter and root respiration dissolving in soil water to form a weak organic acid; (3) formation of strong organic and inorganic acids, such as nitric and sulfuric acid, from decaying organic matter and oxidation of ammonium and sulfur fertilizers. Strongly acid soils are usually the result of the action of these strong organic and inorganic acids. Lime is usually added to acid soils to increase soil pH. The addition of lime not only replaces hydrogen ions and raises soil pH, thereby eliminating most major problems associated with acid soils but it also provides two nutrients, calcium and magnesium to the soil. Lime also makes phosphorus that is added to the soil more available for plant growth and increases the availability of nitrogen by hastening the decomposition of organic matter. Liming materials are relatively inexpensive, comparatively mild to handle and leave no objectionable residues in the soil. Some common liming materials are: (1) Calcic limestone which is ground limestone; (2) Dolomitic limestone from ground limestone high in magnesium; and (3) Miscellaneous sources such as wood ashes. The amount of lime to apply to correct a soil acidity problem is affected by a number of factors, including soil pH, texture (amount of sand, silt and clay), structure, and amount of organic matter. In addition to soil variables the crops or plants to be grown influence the amount of lime needed. In addition to monitoring soil pH the nutrient status of the soil should be examined. To obtain soil sampling instructions and kits along with specific recommendation contact Cornell Cooperative Extension listed in your local phone book under United States Government Offices - Agriculture Department. Text prepared by Donald Bickelhaupt, Instructional Support Specialist, Department of Forest and Natural Resources Management. Illustration by Robert Schmedicke.